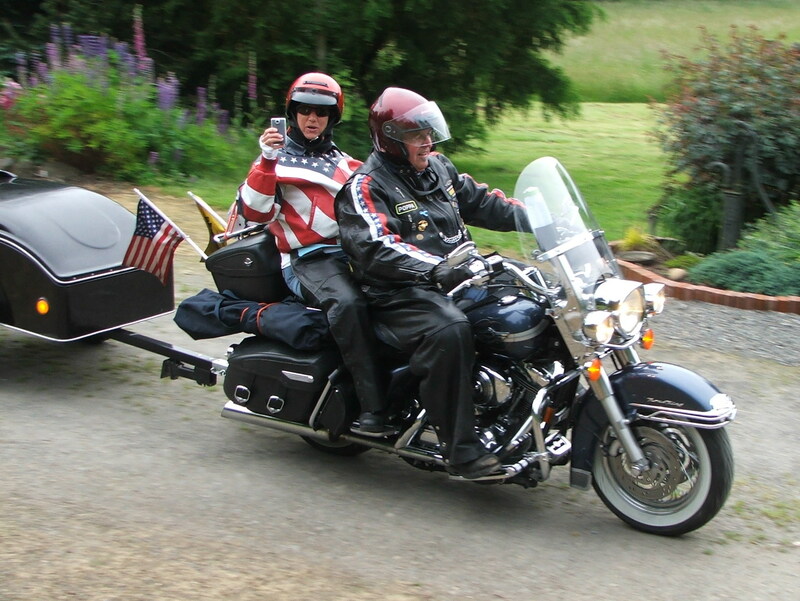 Karen and voice actor David Brower logged over 4,000 miles in June on their Harley Road King Classic - and David kept clients happy enroute with an updated portable home studio. One of the incredible things about being a full time voice actor is the ability to work from the road. This is the third year in a row that my wife Karen and I have taken a long motorcycle trip, and by taking my portable studio along, I can work every night and/or early morning and never miss a gig. Our route took us through the Sierra Nevada mountains, Crater Lake, OR, the Oregon Coast, the Redwoods, Yosemite and Glenwood Springs, CO, just to mention a few of the highlights. One of the coolest parts of the trip was just how busy I was with VO work! It was crazy busy, as I did over 50 commercials and it was so much fun since I could do all that work from the road. So, with that said, here’s my ‘how to’ of putting together a portable studio for the road. Many of my VO friends have Mac’s in their studio and on the road and love them, but I’m still a PC guy. One day I’ll join the Mac crowd, I’m sure … but just not today. My first portable studio served me very well for the first couple of years on the road. There are a lot of options for an affordable basic setup that work well. Editing software. Choose from Audacity, Sound Forge, Wave Pad and many others - anything that’s free can work. Microphone. I chose the MXL 909 with a USB ‘mic mate’. It’s clean, simple, sounds great and is around $135 for both pieces. Pop filter. 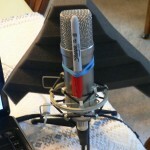 Yep, you gotta protect from those plosives, and you can get a good one for around $50 - but keep reading because the “Sharpie Fix” can save you this $50. External hard drive. You can pick one up on the Internet along with a PCI card and a fire wire cable for $100. Headphones. Grab a pair of ear-buds out of an old junk drawer, or maybe that pair of headphones you stole from United. Sound proofing. This can be done with a pillow fort – yep, it’s what you think … for no cost. DONE! And you are good to go for a total investment close to $500, if you work at it. Well, I decided to upgrade my studio for this latest road trip. I wanted to be able to use Pro Tools and have access to all my studio files and projects, so that if I needed to change any existing projects while traveling, it would be easy to get that done. You just never know what a client will need or when, so being on the road can’t be an excuse for not being able to deliver. This time, it took a lot more brain power and resources to put VER.2 together - but it’s slick and I’m thrilled with it. So I bought the HP Pavilion dv4i for $750. Note: This is not cast in stone information - only my experience, so please get with a tech savy person you can trust (like I did) before you commit to a laptop. Everything I’ve read said that even though there is a beta out there of Pro Tools for Windows 7, not everybody was happy with it. Since I knew my systems work well with Windows XP, I bought the Windows 7 Professional software. It has a “virtual Windows XP” option, so you can run everything off Windows 7 - including those few programs that only run on Windows XP. It’s like having two computers in one. Well, it’s weird and it’s a pain, and I’m sorry to say that it didn’t work for me in trying to set up Pro Tools. Too many shared memory issues. So I did. I followed the Digidesign instructions for the beta install to the letter, and it worked perfectly the very first time. Sa-weet!!!! I have a Rode NTK as my studio mic, so I wanted a comparable sounding mic - but a quiet mic, as well. One that would be better suited for the road. I needed an Mbox 2 mini for the road and Pro Tools software, so I picked up both from my friend Robby Resnick at Sweetwater Sound for less than $300, and it included everything I needed. My home studio has the Wave Arts Power Suite 5 and I wanted that on my laptop. Oops again. You see, Wave Arts didn’t like Windows 7, either and so after some advice from my friend Allan at Southwest Recording Studios, I bought a VST to RTS adapter from FXpansion.com. 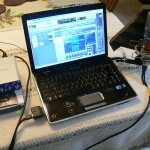 It is software that allows you to “wrap” different plug-ins into Pro Tools while using Windows 7. $99 is all. My external hard drive is the same exact one as I had before. That way, I can take every Pro Tools session off my studio hard drive and drop it on my external hard drive. Simple. The only difference was because of the new HP laptop, I needed a different PCI card for my fire wire connection. $29 at the local PC shop. In my studio I use the Sony MDR-7506 stereo monitor headphones. I found a great pair of “road” headphones on sale at Guitar Center. Sennheizer HD-280 pro’s, only $80. I’ve tried Harlan Hogan’s original Porta-Booth, and while it works great for many - for me personally, I didn’t care for it. I took it on one road trip and quickly realized I’m too big and it’s too small. However, after my trip, I purchased his newer model, the Porta-Booth Pro. There was one session on the trip where I could have used it. But other than that one session, with my small triangle Auralex foam piece behind the mic, my Sharpie and my pillow fort, I was very well set up. YES you heard right. While I do have a pop filter for the road, my friend Allan told me the Sharpie trick works just as well and takes up no space. Just rubber band a Sharpie to the exact center of your mic, and you are golden. Who knew, huh? So the Auralex piece and the Sharpie - less than $20. Back in the day, I used a portable printer when I was a marketing manager for the 8th largest automotive group in the country, and traveled to 29 different dealerships in 12 states. Man, it came in handy, so I decided to add this to my portable studio as well. Candidly, there is something about being able to actually hold the script! An HP H470 mobile printer, for $168. DONE. And you are good to go on the road with VER.2 and your total investment is easily under $1500, if you work at it. That’s without the printer option, of course. One option for either VER.1 or VER.2 is an “air card” so that you are guaranteed of having Internet service no matter where you are. I know many folks who use that, but for me its $60 a month for two years plus the gear itself, so not worth it. When I travel I just confirm that every place I stay has high speed Internet available, period. Oh and one other thing. Be sure to check with your tax adviser firsT, but for the right scenarios it’s possible to travel, do voice work, and write it off. Need I say more? Hope this article helps you to get on the road, traveling, working, and having all the fun in the world that I am having. 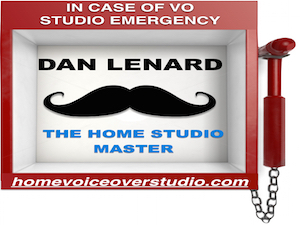 My goal since I started doing voice work full time, on May 1, 2008, is to never ever have a real job again. So far, so good! David Brower is a former radio and television professional and was an automotive advertising specialist for the 8th largest automotive company in America. 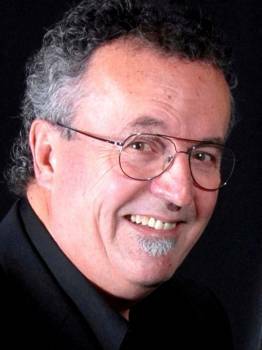 After doing voice work on a part-time basis for over 15 years, “Poppa” is now a full-time voice actor and audio producer based in Loveland, CO. He has voiced and/or produced automotive commercials in over 40 markets, produced a 20-voice animated cartoon, and has clients in Germany, Norway, and India. He also publishes a popular blog, Poppa Unplugged. Thanks for the info regarding Windows 7. Just bought a new HP laptop and thought that I would go with the delivered software. All I have to do is upgrade ProTools and I'm set to go myself. Thank you, Dave, for the information. Surprisingly, I put together a similar package ... an RE-20 microphone, Sony headsets, a laptop with Reaper and a FX package. I record to a Sony digital recorder and then transfer the file to the laptop. It works great. I have a digital converter for the microphone, but I've gotten used to doing work this way. It sounds great too. Again, thanks for the information. And drive carefully. Yes, we do have a photo of the Sharpie set-up, and it's now with the article. Thanks for asking! Man. You are now one of my heroes. That is the way to work. Anywhere you want. Question? Is there a photo of the Sharpie setup?